As Henry (Chapter 10) emphasises here, insects are preadapted to be noisy animals. With a hard and sclerotised exoskeleton, the segmented form of the body and jointed limbs will inevitably cause vibrations in the surrounding environment when an insect moves. It will be very difficult for insects to move silently without making a noise. It is not surprising that many groups have developed specialised systems of sound production and associated receptors which are used in communication within and between species. These categories are not completely exclusive and some insects may use combinations of them. In addition to Ewing, many others have also reviewed sound producing mechanisms, including particularly Haskell (1961) and Dumortier (1963a). It is therefore unnecessary here to review them in detail, but some comments may be useful to the general readers. All animal sounds result from the vibration of some structures. However, in this category are included sound emissions which result from vibrations of relatively unspecialized parts of the insect body, most usually oscillations of the abdomen, either dorso-ventrally or laterally. The term tremulation is useful for this type of sound production and differentiates it from the very general term "vibration". Such sounds are usually transmitted through the legs to the substrate on which the insect is walking or standing. These will therefore usually be detected as substrate transmitted vibrations. Such signals have been documented in various insects, but are well known in lacewing flies and their allies, due particularly to the work of Henry (Chapter 10). Vibrations of other body parts may be important in insect signalling, most obviously the wings. Sounds are inevitably produced as byproducts of flapping flight, but many insects have developed the use of wing vibrations in communication. The flight sounds in swarming mosquitoes are known often to be species-specific and to function in part, for species recognition, (e.g. Roth, 1948). The use of low frequency wing vibration in the courtship dances of Drosophila species is better known. When in close proximity, the pulsed songs of these flies stimulate antennal receptors of other individuals by air particle vibration in the vicinity (Bennet-Clark, 1971). In this book Hoikkala (Chapter 11) describes the diversity and genetics of these signals in Drosophilidae. Tremulation does not involve percussion either of the substrate or of other body parts. This is regarded as a separate mechanism. Percussion of one body part against another may develop as a communication system, as documented for example, in some Australian moths (Bailey, 1978) and in some cicadas (Boulard, Chapter 25). Signalling by percussion of the substrate with the tip of the abdomen is well known in various insect groups, for example termites (Isoptera) (Howse, 1964) and particularly stoneflies (Plecoptera) (Stewart and Sandberg, Chapter 12). An unusual example among the bushcrickets (Tettigoniidae) are the species of Meconema. It is a group otherwise well known for the production of loud stridulatory signals (Heller, Chapter 9). Males of Meconema lack the distinctive stridulatory mechanism typical of the family, but actively stamp the substrate with one of their hind legs and produce patterned signals in that way (Ragge, 1965). The term stridulation has sometimes been used as a general term for any mechanism of sound production in insects (e.g. Haskell, 1961), but that negates the utility of the term. It is more usually confined to sounds produced by frictional mechanisms, involving the movements of two specialized body parts against each other in a regular patterned manner. This is an extremely widespread and relatively well-studied mechanism. Such systems have been described in at least seven different insect orders (Ewing, 1989), in most of which it has evolved separately on numerous occasions, as for example in the Coleoptera (Wessel, Chapter 30). Almost all body parts which it is possible to bring into juxtaposition have been modified as stridulatory mechanisms in one group or another (Dumortier, 1963a). The mechanisms in the groups of Orthoptera sensu lato are particularly well-known and documented (for example the Tettigoniidae by Heller, Chapter 9). These rely on the deformation of a modified area of cuticle, usually by contraction and relaxation of special musculature within the body. This results in a series of clicks which may be repeated rapidly in distinctive patterns. Such signals may be amplified in a variety of ways in different insects. The specialized area of cuticle, as exemplified most obviously in the loud singing cicadas (Hemiptera, Cicadidae), is known as a tymbal. The basics of this mechanism were known to the ancient Greek philosophers, but were first described precisely by Reaumur (1740) (Boulard, Chapter 25). 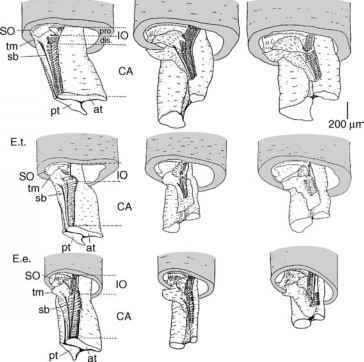 Such mechanisms are now well known, though not necessarily well understood, in many other groups, including most, if not all other Auchenorrhyncha (Ossiannilsson, 1949; Striibing, Chapters 19 and 26; Cocroft and McNett, Chapter 23; Tishechkin, Chapter 24), many Heteroptera (Gogala, Chapter 21) and various families of Lepidoptera (Sales and Pye, 1974). This is an unusual and rare mechanism within the Insecta. Various authors have described in a number of insects exhalatory sounds, often expelled via the tracheal spiracles, but little is known about any function (Ewing, 1989). The best-known example is the large and spectacular European hawkmoth, the Death's Head Hawk, Acherontia atropos, which expels air forcibly through the mouthparts to make a distinctive piping sound (Busnel and Dumortier, 1959). Sales and Pye (1974) reported similar sounds produced by several African Sphingid moths. Thus many sound producing mechanisms have been described for a wide variety of insects, but many exist only as possible mechanisms based simply on surmise from morphological evidence. Which type of sound produce insects?